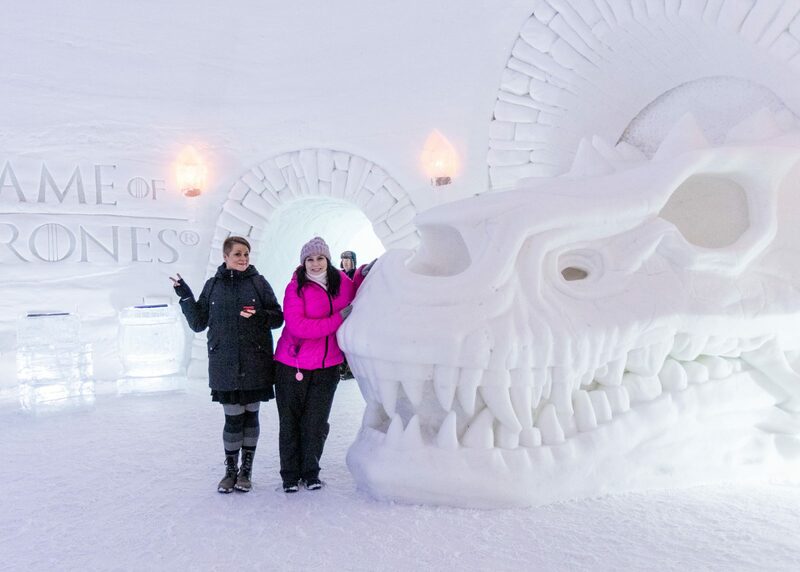 This Snow Village in Finland is a Stunning Tribute to "Game of Thrones"
Have you heard about the Game of Thrones snow village yet? 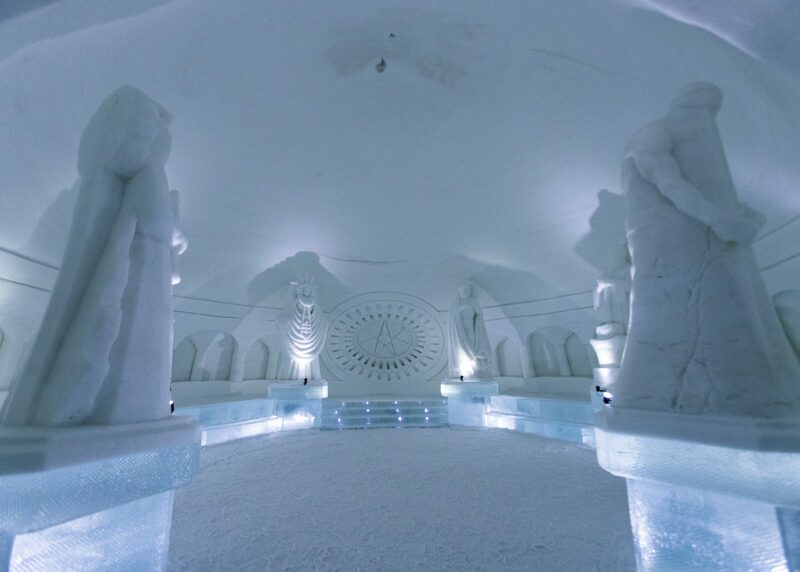 When we say “snow village“, we aren’t kidding or making it up: such a thing exists and it’s even more magnificent than you could ever imagine. 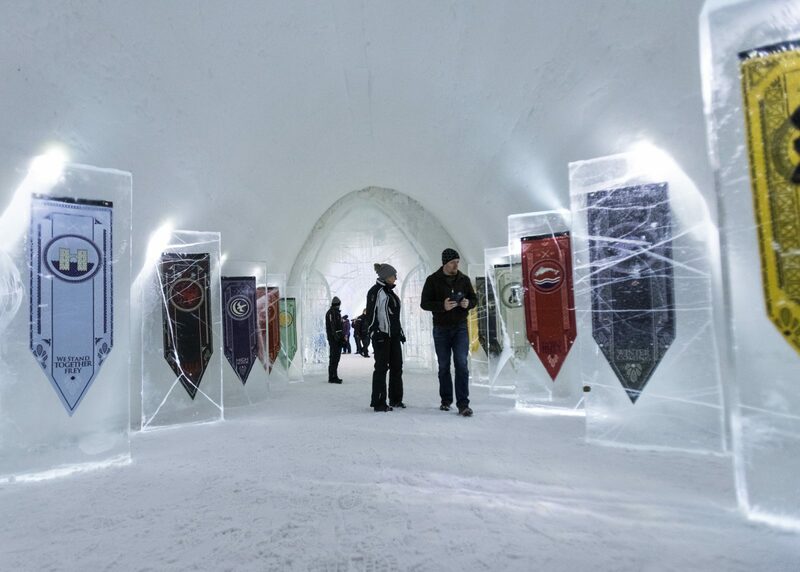 We visited the Game of Thrones Snow Village in Kittilä, Finland with our friends at HBO Nordic and oooohhh, wow! It was even better than expected. 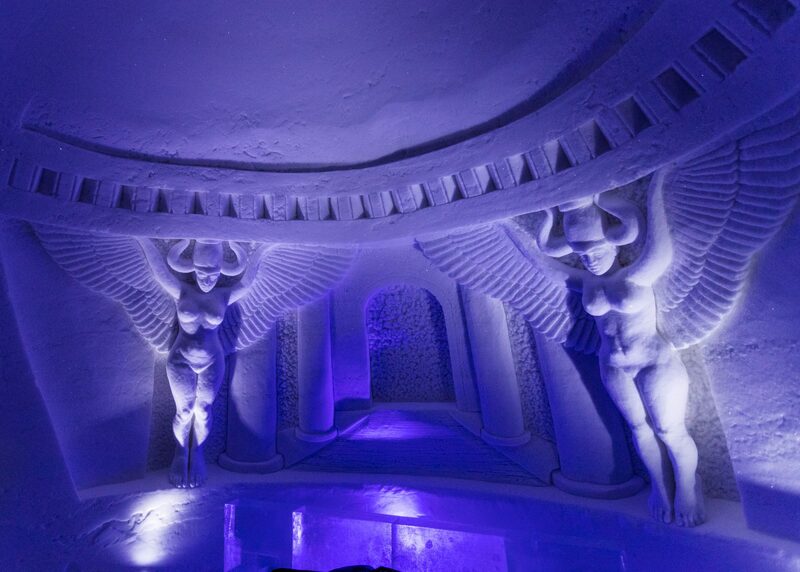 Check out our photos from this one-of-a-kind (and cold!) experience below. 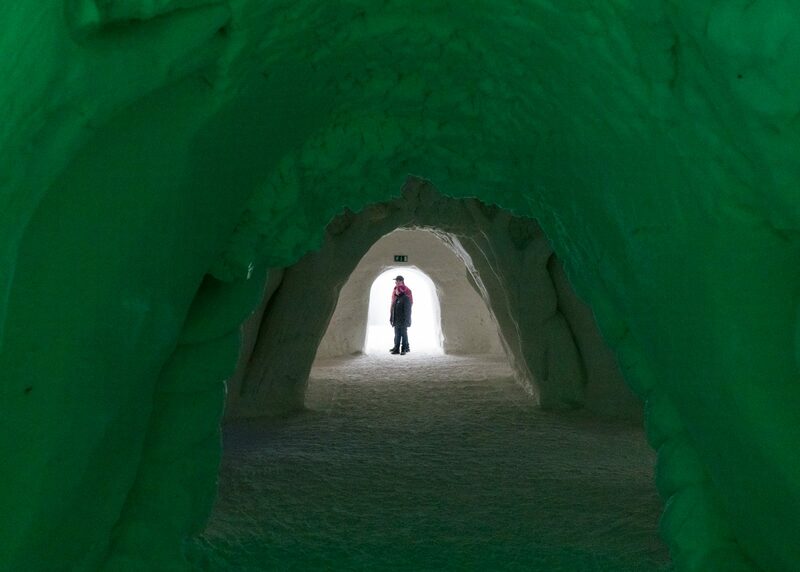 Imagine walking inside a big pile of snow. 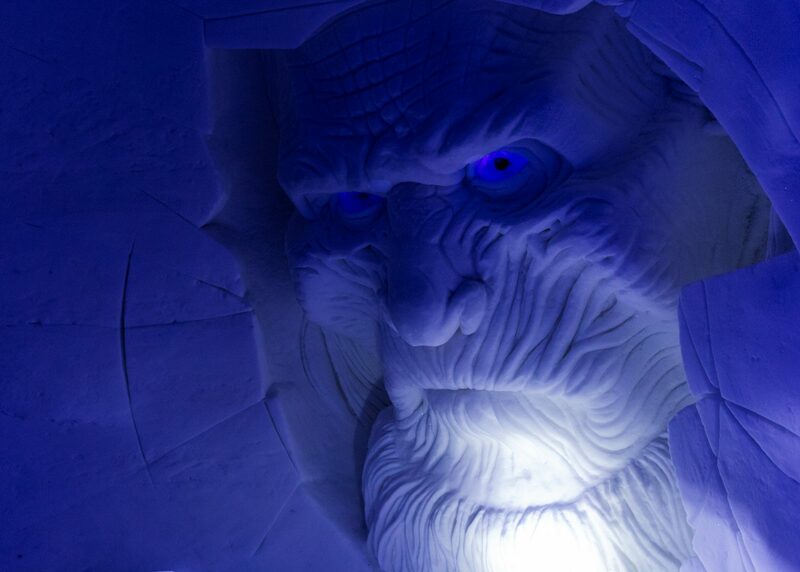 There’s the entrance, a very ordinary looking door which is more like a hole in the wall than anything else, except the walls surrounding it are snow. 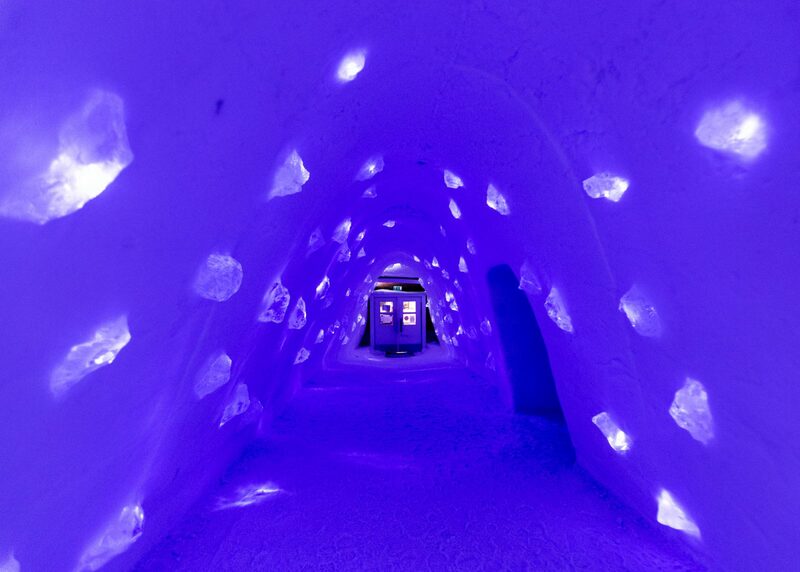 Once you step in, you’re in a big hallway, shaped like a globe or an egg. 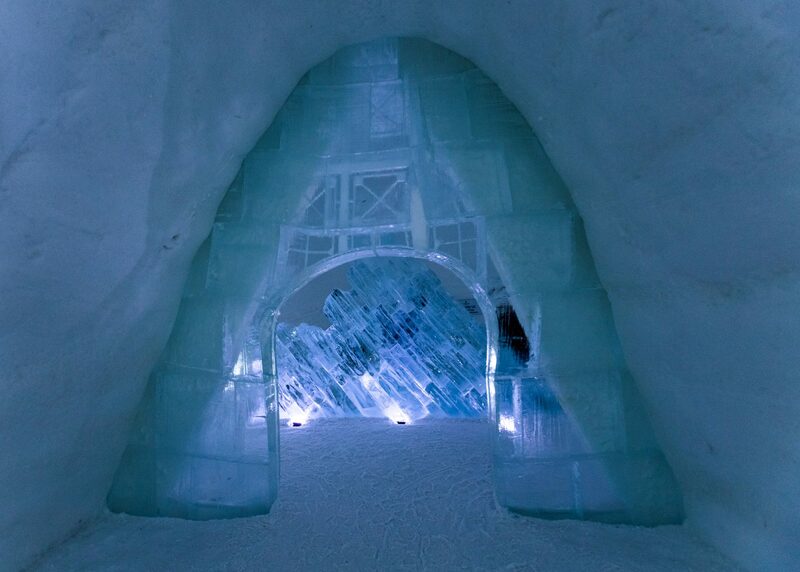 Everything around you — the floor, the walls, the ceiling — is ice and snow. Getting lost in a snow forest. 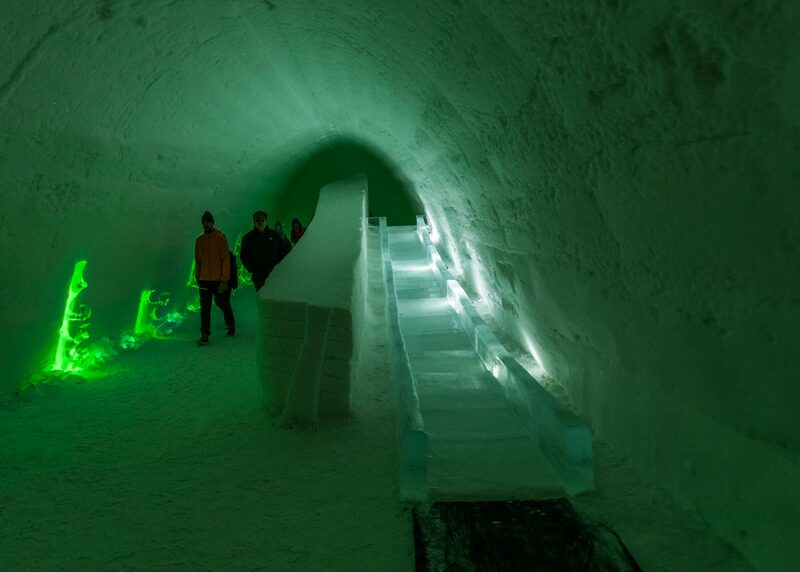 Surpsisingly, none of us feel claustrophobic at all inside the massive snow castle with barely any windows or natural light. 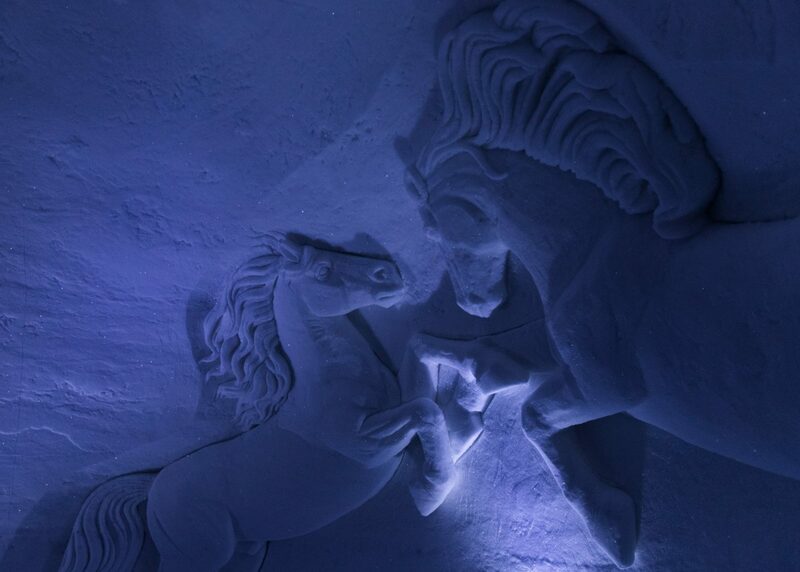 For two, three hours we walk along snow corridors filled with astonishing sculptures and details. We take selfies, group photos and just quick snaps of everything around us, trying to capture it all the best we can. 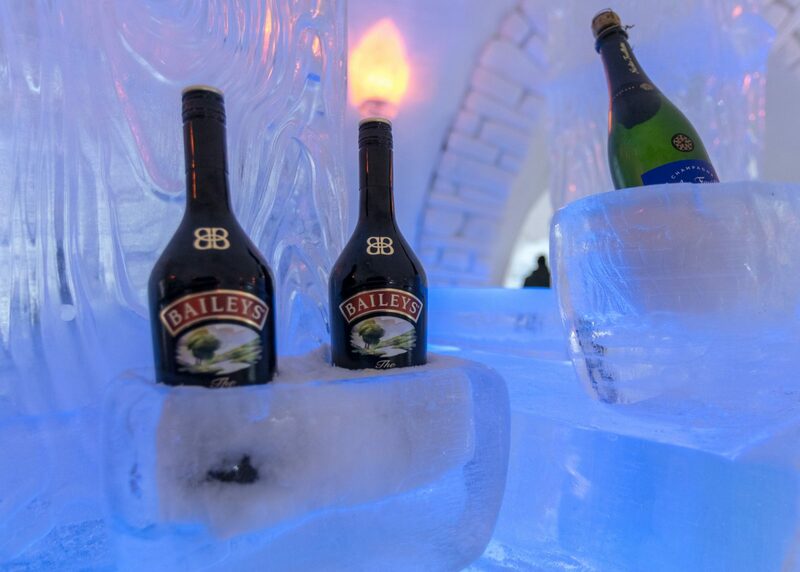 And then we stop for some alcoholic shots in the ice bar. 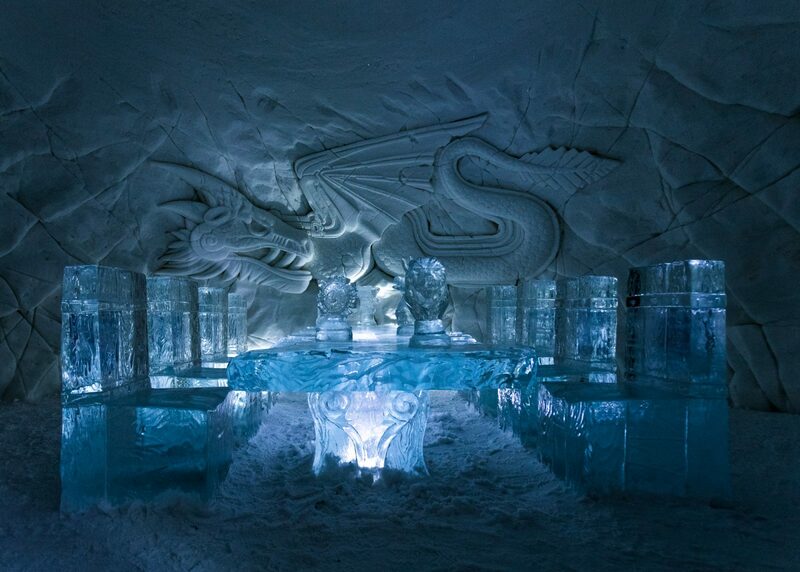 The icy shot bar at the Game of Thrones snow village in Kittilä, Finland. 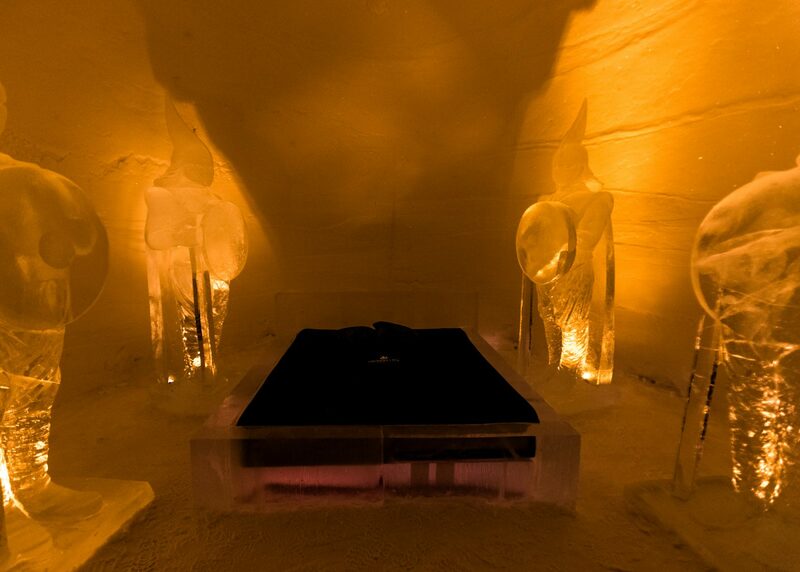 Wanna sleep on an ice bed? 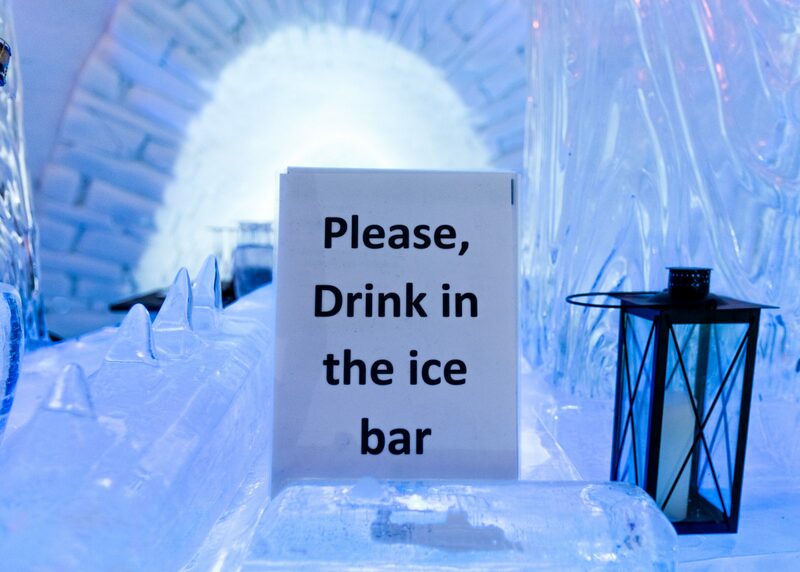 Apart from a shot bar and a separate champagne bar (! 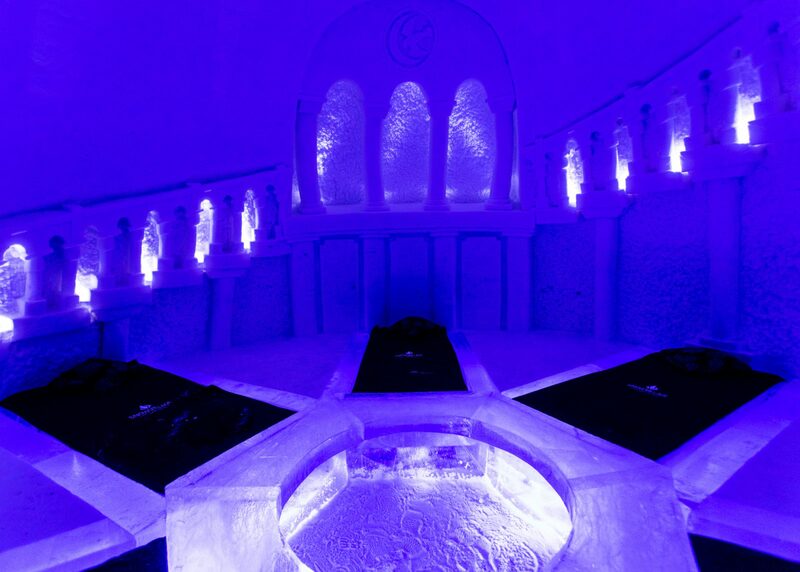 ), an ice restaurant and endless amount of incredible decorations, the Snow Village has 16 hotel rooms for guests to spend a night in. 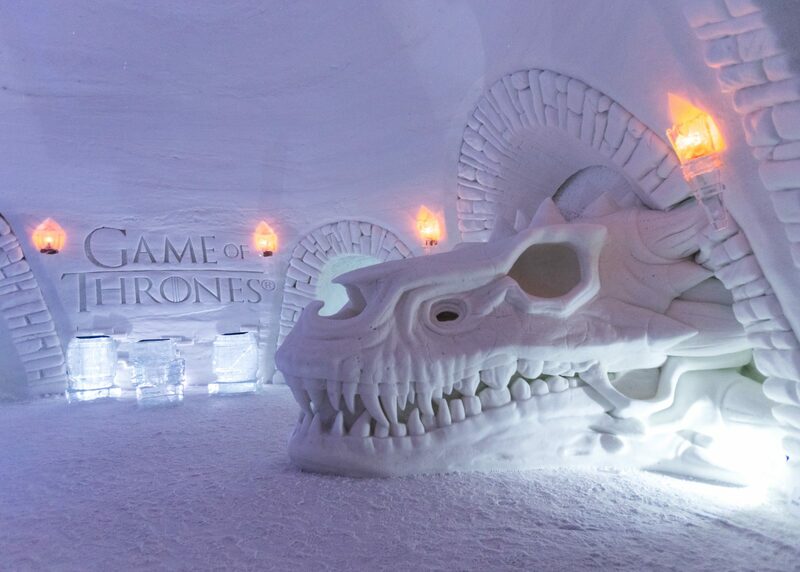 Each of the rooms is, of course, decorated with sculptures inspired by some of the biggest Game of Thrones scenes. During daytime, they’re all open to visitors so you can pop in and admire the art. 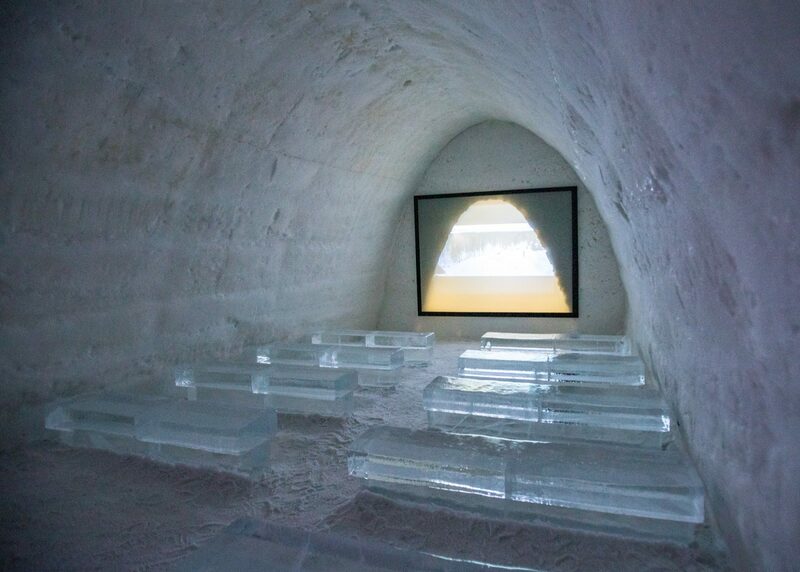 At night, they’re reserved for any brave-hearted snow hotel guests, who get to sleep on comfortable beds inside warm sleeping bags. 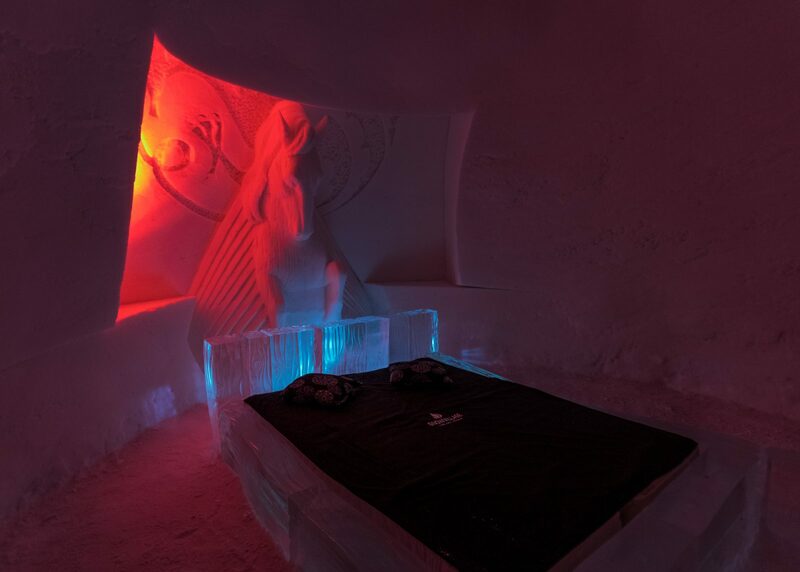 The bed itself is a normal bed with a comfortable mattress, but the bed frame and everything else is — you guessed it: ice and snow. 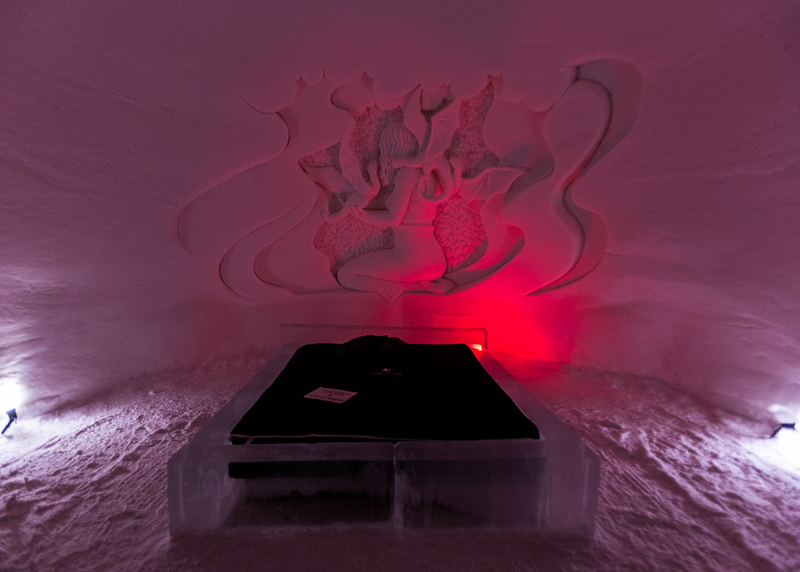 The Birth of the Dragons inspired room comes with a kingsize bed. 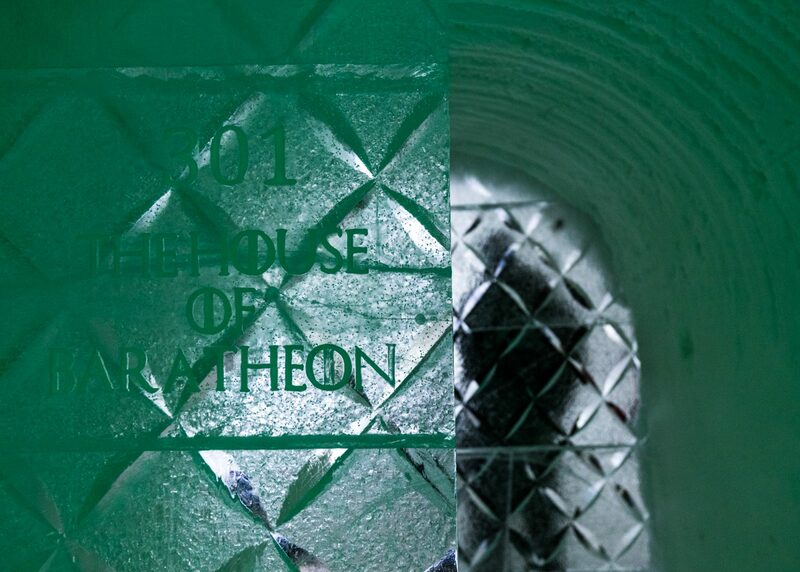 After the first room (“Birth of the Dragons”) we visit 15 rooms more with different themes, artwork, sculptures and atmosphere, each more impressive than then next one. 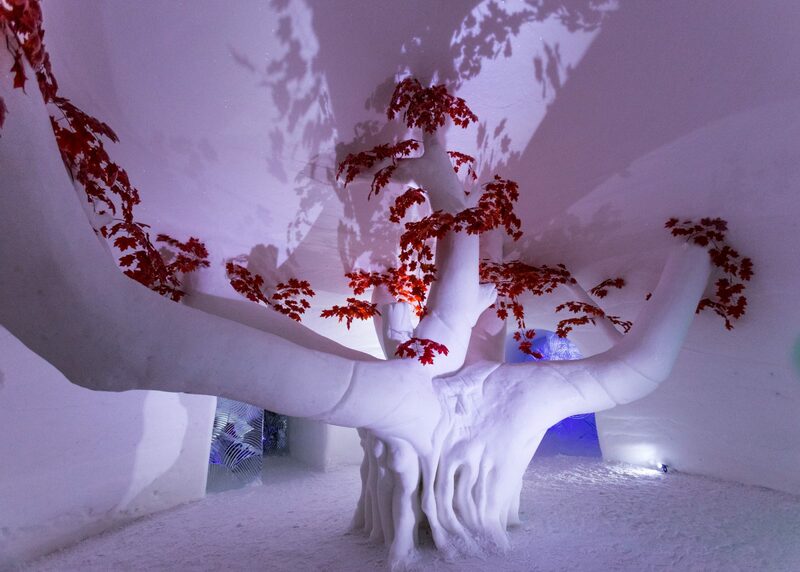 See the full snow hotel photo gallery at the end of the article! 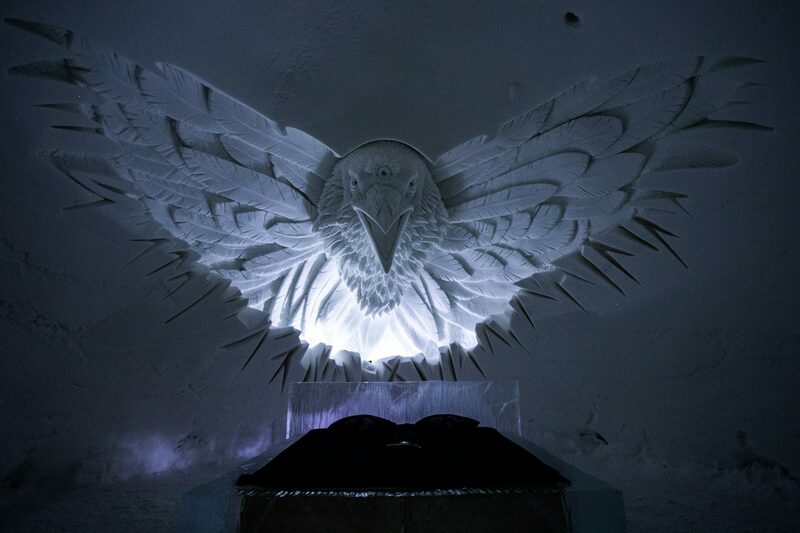 A wall-sized Three-eyed Raven to guard your sleep? Sure. Why not. 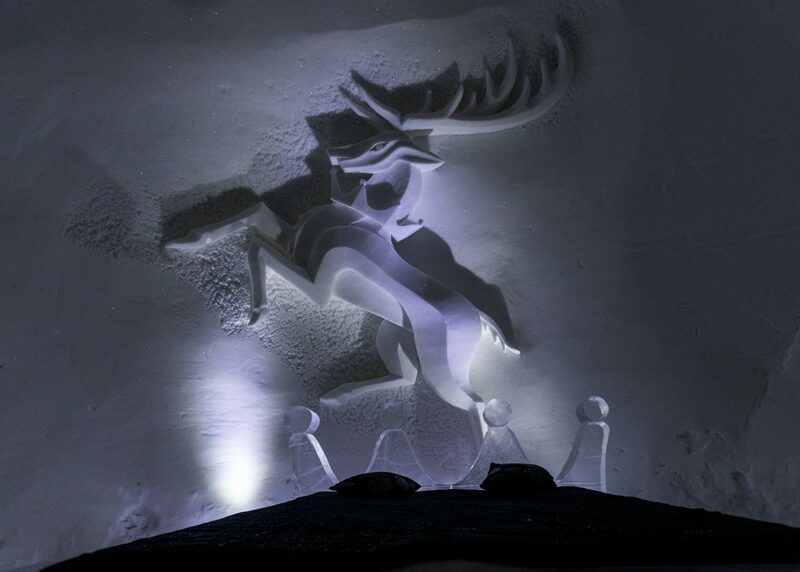 The dramatic effect certainly comes from the impressive work done by ice and snow sculptors from several different countries, but the colorful lights and attention to detail just adds to it. 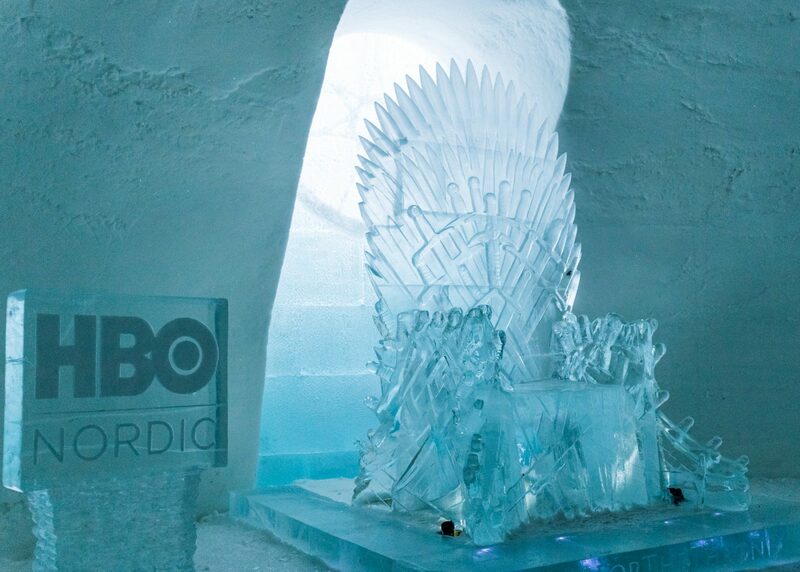 If a Game of Thrones inspired snow village exists, there obviously has to be ice thrones as well. And we got to try them both! What was that like, then? Two words: cold butts. 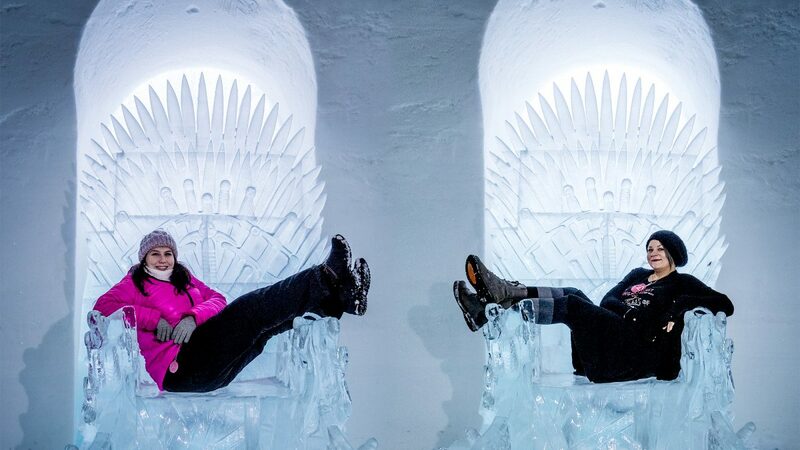 “Ice Queen” sounds like a pretty cool title (literally), but to be completely honest… two minutes on that throne was quite enough. Especially for Tiia, who never knows how to dress approriately for the weather. At the end of our visit, we enjoyed a quick (but oh, so delicious!) 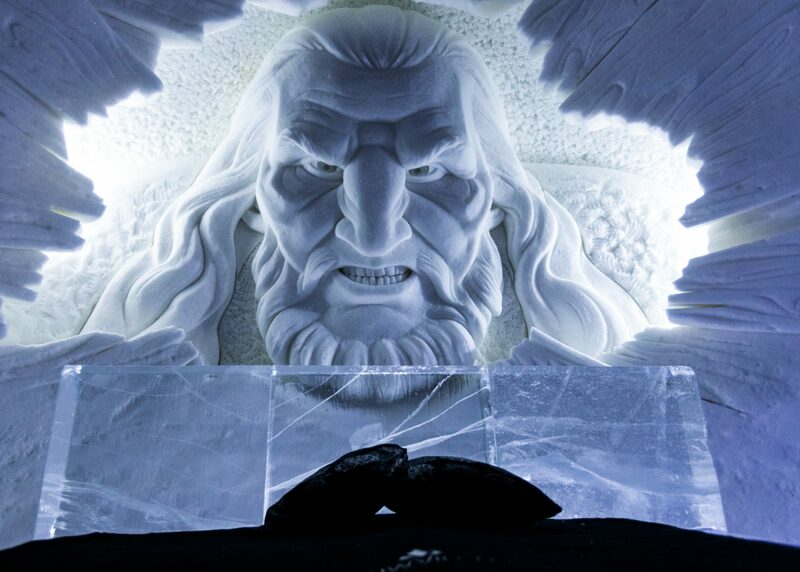 dinner at the ice restaurant. And again: everything was ice. The benches, the tables, all of it. Wrapped in thick blankets, we ate our weight in the most delicious brown butter & fresh bread of all times, plus some local delicacies and as a finale, some mouthwatering desserts. 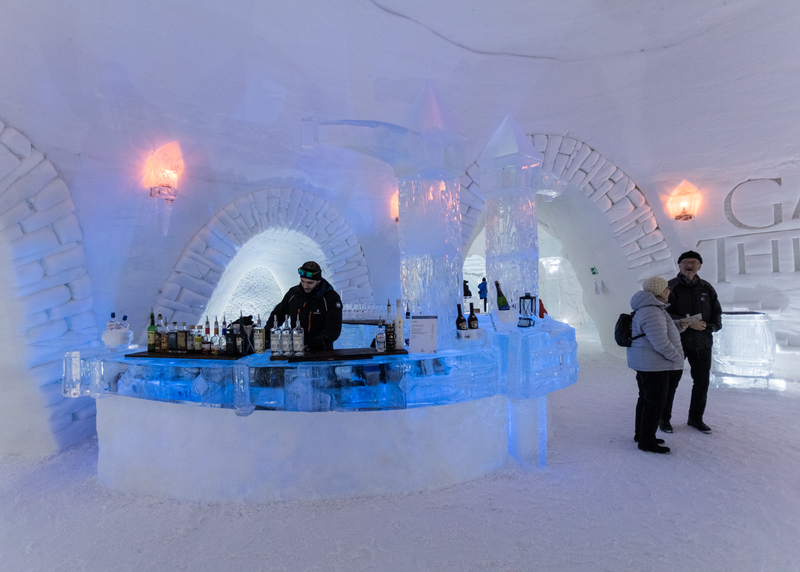 Next to us, the champagne bar made out of ice was waiting to be opened for the night for the visitors. 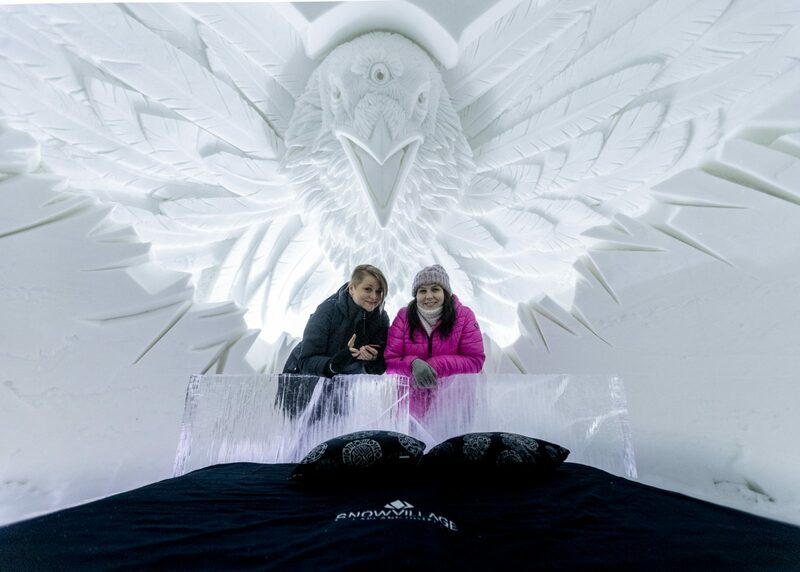 So how many working hours does one need to complete a massive operation like this, we asked, and learned that this year’s snow village took 50 constructors, sculptors and other workers 5 weeks to complete. 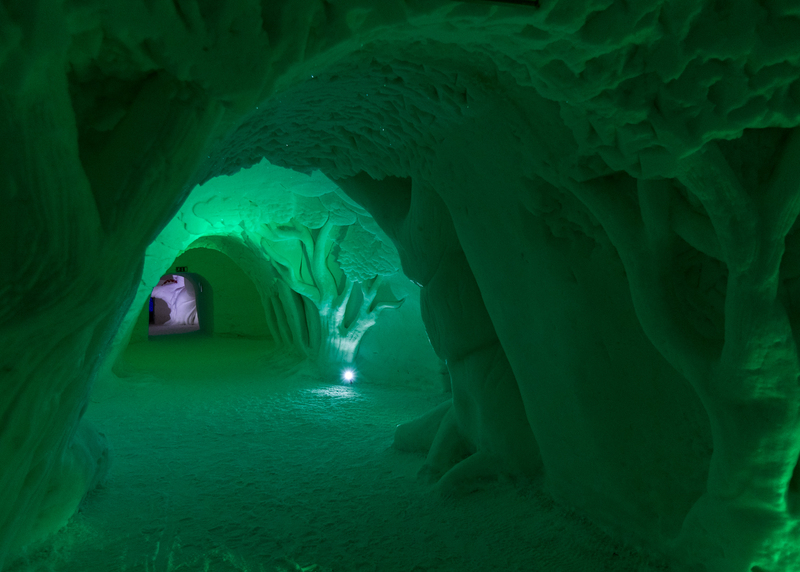 All the structures have been carved out of thick snow — so thick that it weighs almost as much as ice. This is to ensure that the structures carry their own weight and never collapse on people inside, even on warmer days. Happy fangirl bloggers posing with the dragon skull. 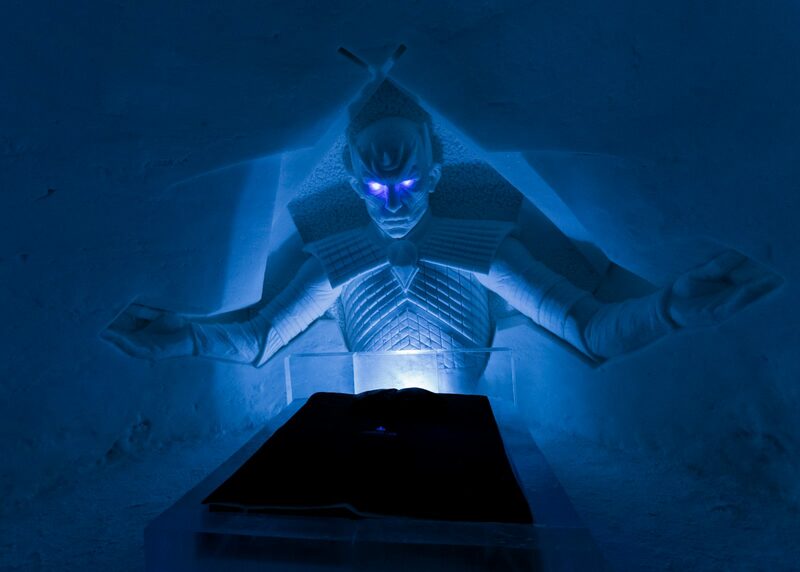 In about a month from now, the snow village will be closed and left on the field to melt away. Which means all of these beautiful pieces of artwork will be lost forever. 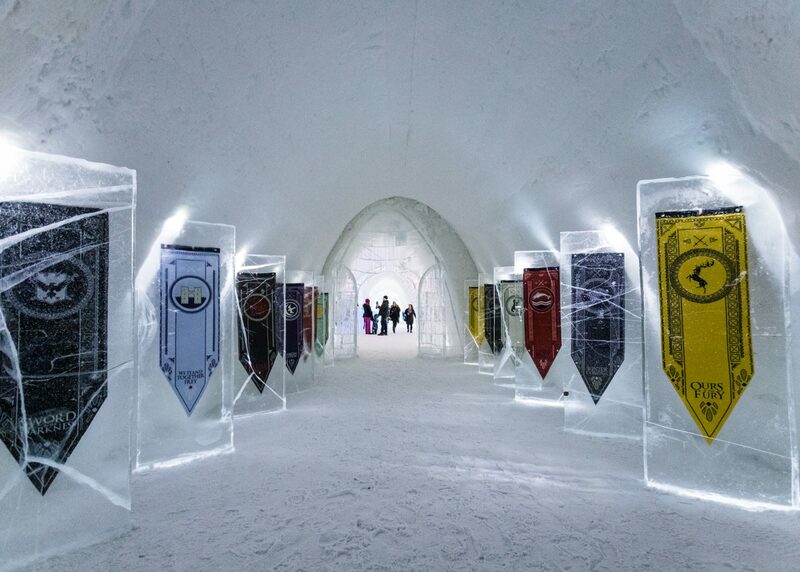 Even though the Game of Thrones theme was chosen for the second year in a row, it’s uncertain if our beloved Westeros tales and characters will make a comeback or if the village will be filled with other themes and art at the end of 2019. 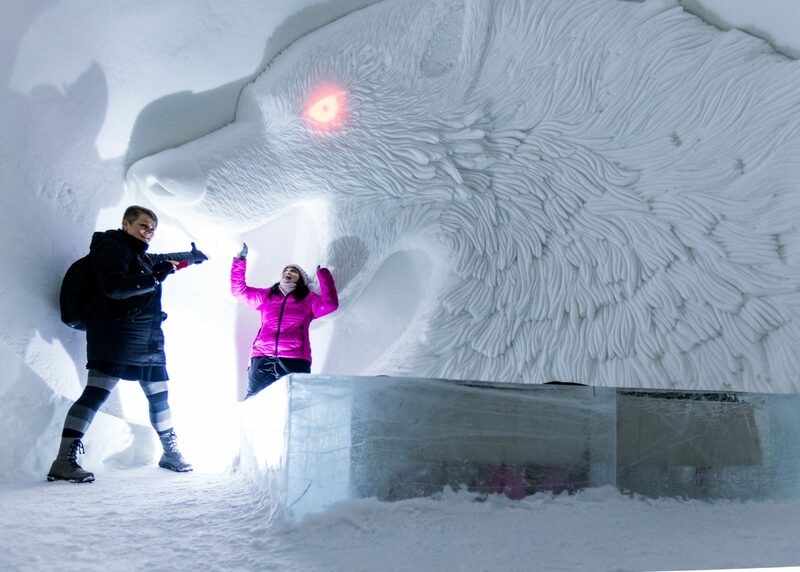 So if you can, make your way to Finland’s Lapland and visit this magnificent attraction! 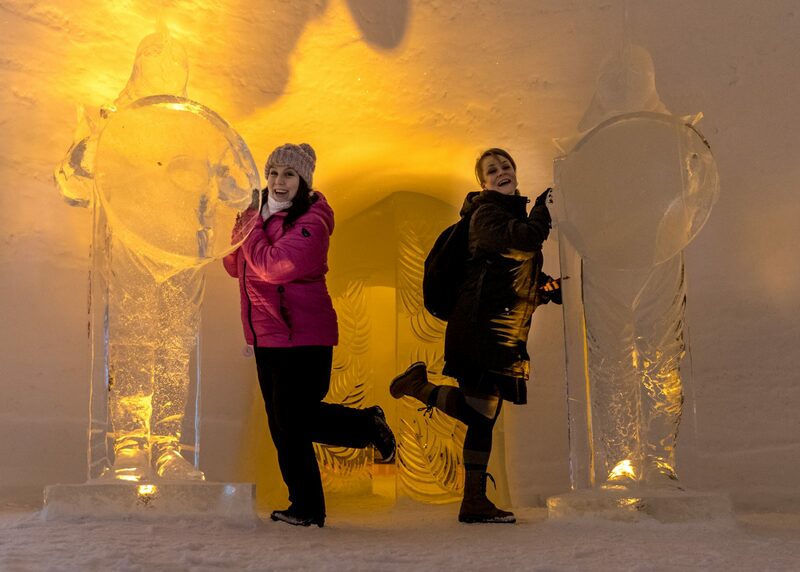 For exact closing dates and opening times, accommodation details and other information on Snow Village’s official website. 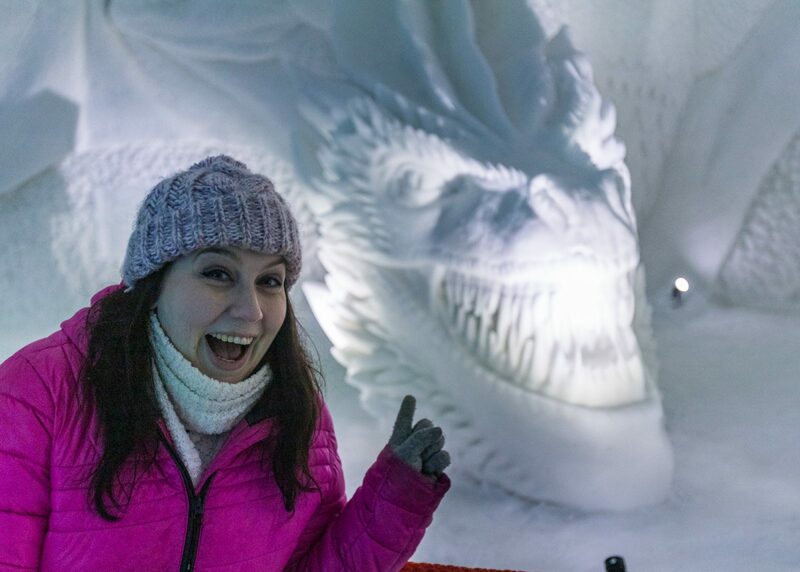 A cheeky selfie with the dragon. Yes, we will, thank you very much. 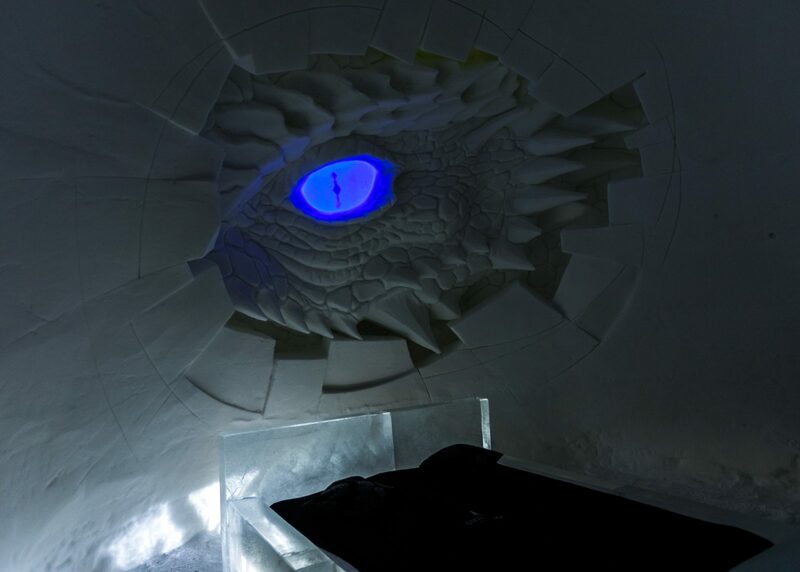 The dragon skull at the ice bar. Bloggers getting eaten by the direwolf. 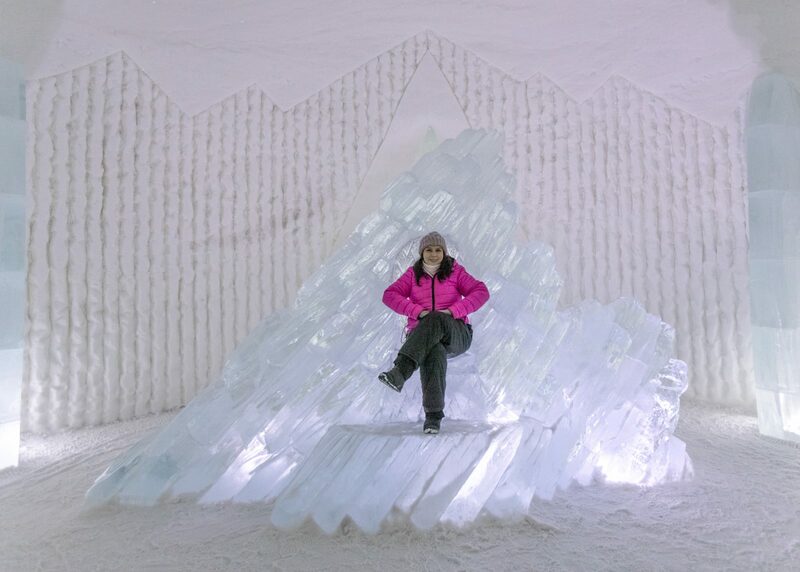 Satu posing on the Dragonstone throne. 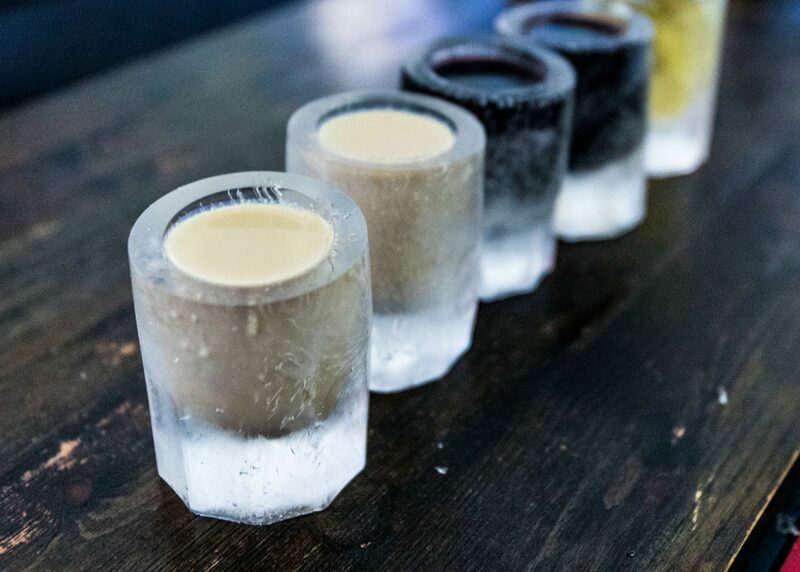 Shotglasses made out of ice. The screening room with chilly benches. Are you getting the feeling of being watched? Us too. The three-eyed raven guarding your sleep. 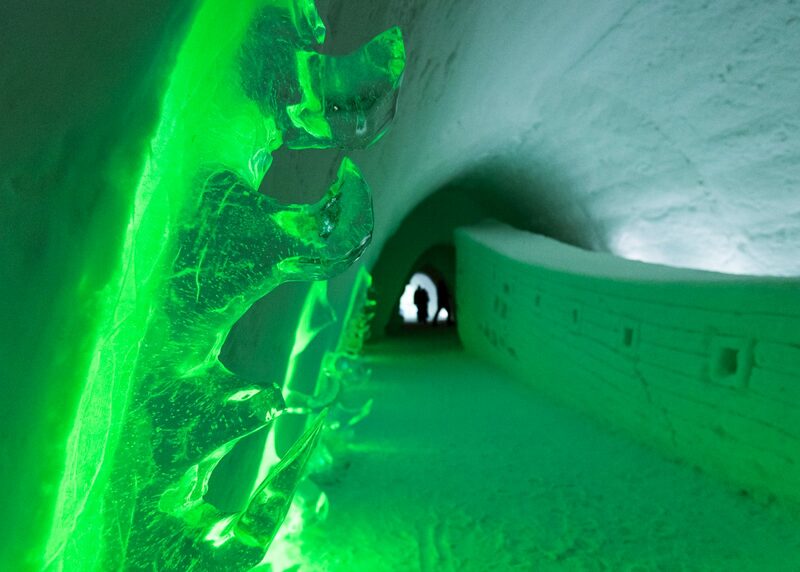 Fun fact: for security reasons, the ice hotel isn’t allowed to have closed doors. 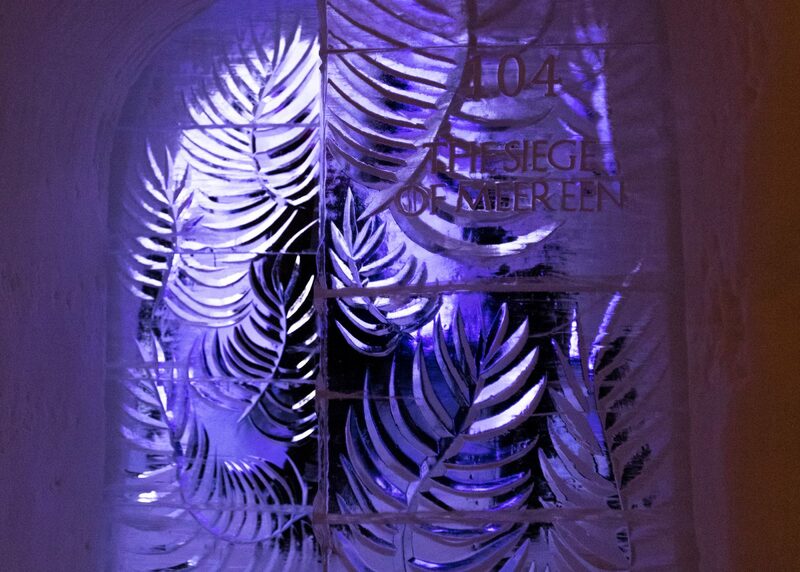 Only panels covering the doorways. 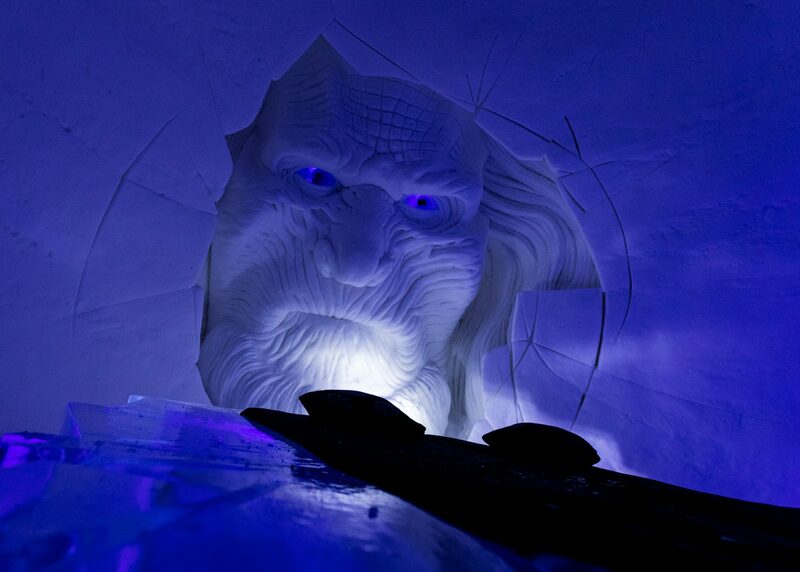 This guy’s eyes seemed to be following you no matter where you walked in the room. Not creepy at all. Just fine. The crown bed for those who want to sleep like kings and queens. 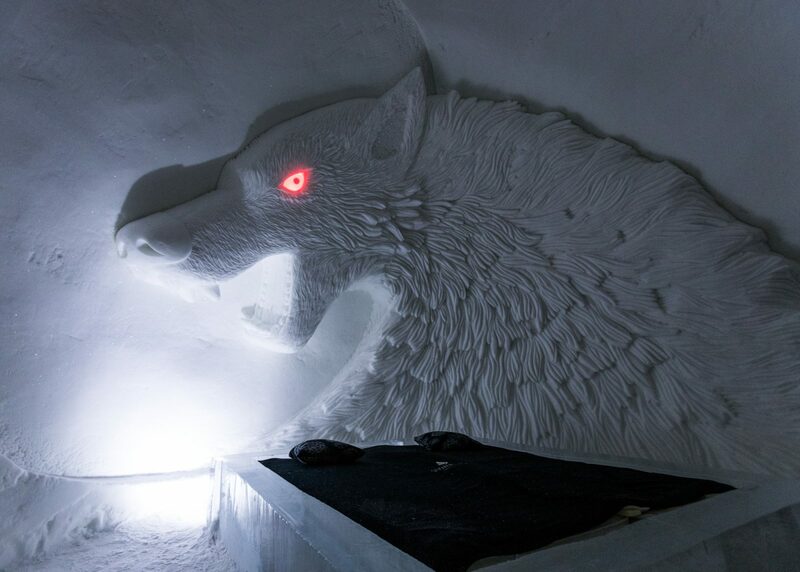 This Direwolf will guard your sleep. 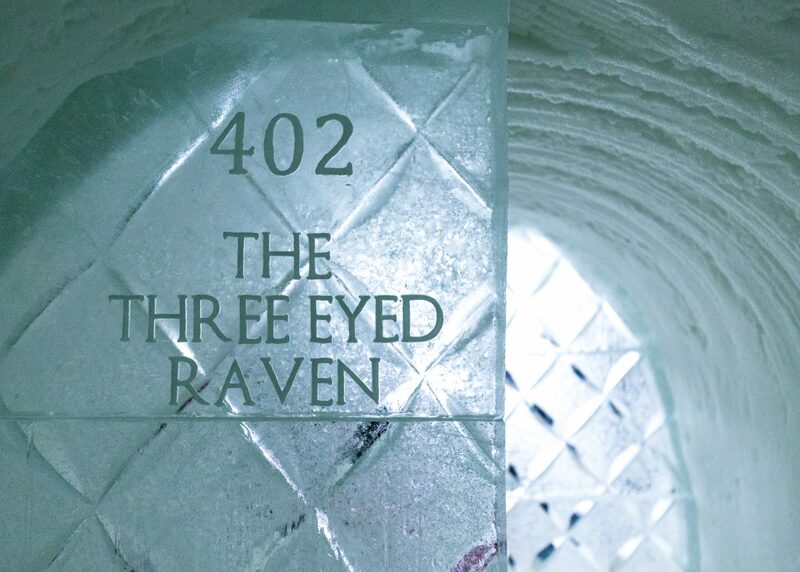 Eyrie’s moon door makes a nice centerpiece for a five-bed room. A bed surrounded by the Unsullied. No nightmares. Just Wun Wun. 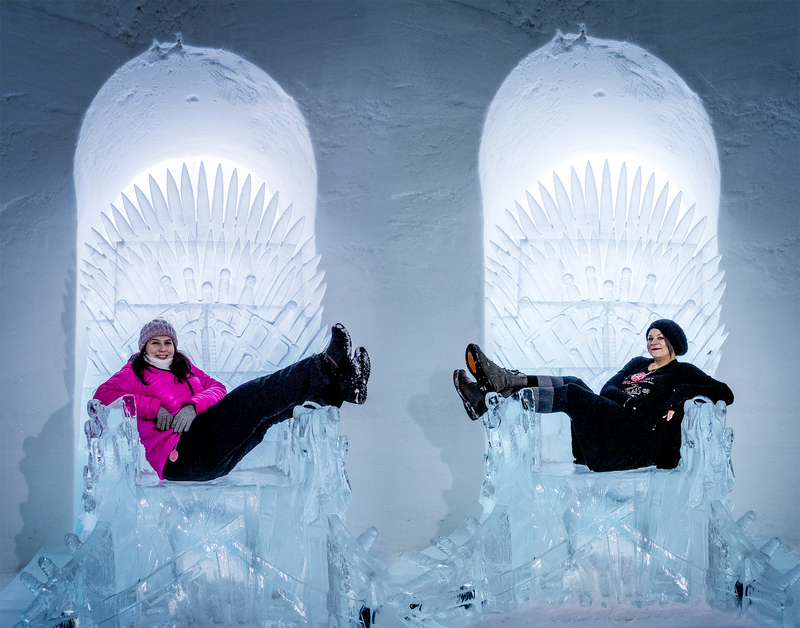 The trip to Kittilä’s Snow Village was a press / blogger trip organized by HBO Nordic. No money exchanged hands. Just mutual happiness. 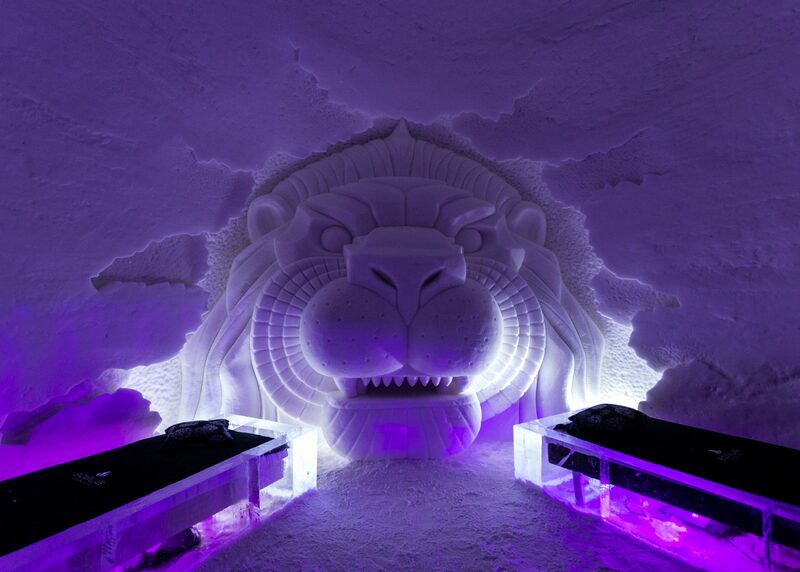 Looks an amazing place. Great photos and stories as always, ladies.